The first set we created was all about weddings! We love the dark and luxe feel of this gold and black combination, and all it took were fun decor and tape! We used the Gold Glitter Alphabet Letters to spell out Mr & Mrs at the top. Gold Tissue Rosettes were attached to give the look dimension. Then Tissue Paper Tassel and Glitter Mini Banner Garlands were mixed together for a full, finished look. Don’t forget the props! 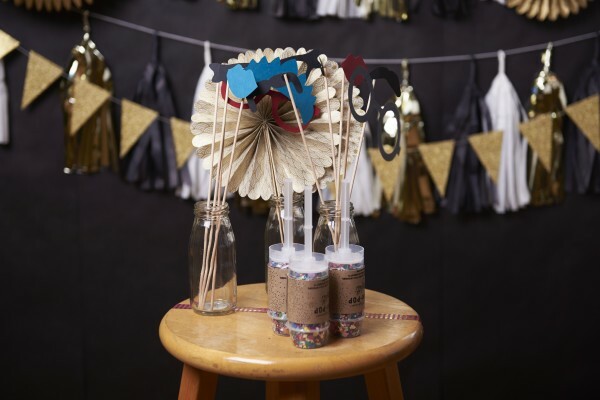 Assemble the Photo Props Kit and leave it, plus Reusable Confetti Poppers, on a table or in a box next to the background for people to take silly photos (other popular items could include silly hats, feather boas, and more). Another tip: If you can’t afford for a photographer, make the photo booth a Selfie Station! Leave a few Selfie Sticks so people can hook their phones up and snap photos themselves. Ask them to send the photos to you (or use an event hashtag to see them all on social media) so you can create a photo album. Seriously, don’t forget the Reusable Confetti Poppers – not only are they fun to use, but they make really great photos. Our next set is a background that could be used for everyday parties like birthdays, baby showers, cookouts and more. The great thing about making your own photo booth is you can easily set the mood. Unlike the formal look of the first booth, we made this one fresh and fun. 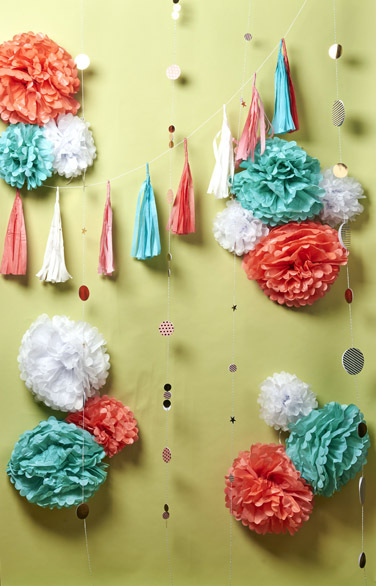 To create this look we used Tissue Paper Pom Poms, a Colorful Tissue Paper Tassel Garland and Trend Party Confetti (we taped the confetti to twine). We also used the Painted Celebrate Banner (You Rock is printed on the back) as an interactive prop. Which one is your favorite? 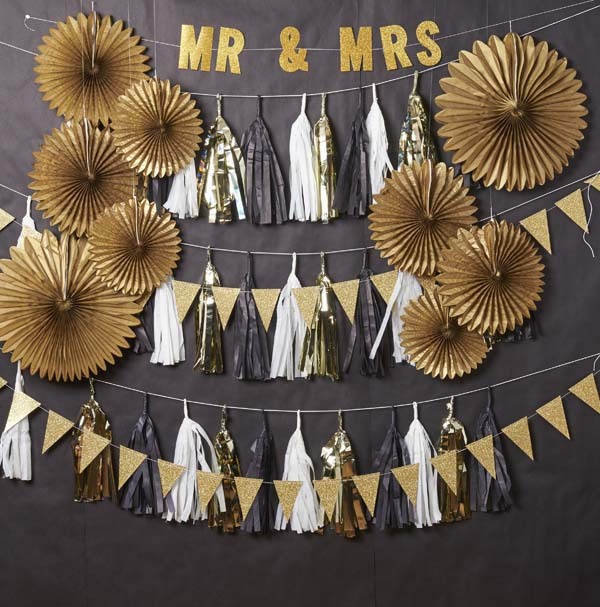 How will you incorporate a photo booth at your next event? Tell us in the comments! Totally using this idea for my graduation open house! Hello, I was wondering What brand of wrapping paper you used. I want to do this for my wedding but I am having difficulty finding chalk board wrapping paper in stores. Hi! I was wondering how you did the lighting for the selfie station? I’m planning a bachelorette party in a hotel room and need advice. I can’t travel with an umbrella and huge light! Thanks in advance!